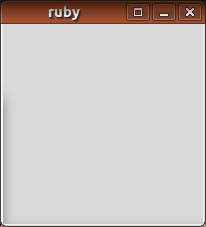 The Ruby language supports creating windows for GUI (Graphic User Interface). GUI applications are programs that respond to user input, which are usually mouse events, such as clicking buttons, clicking menus, etc. Widgets – basic GUI objects that can be put directly in the window. Most of them generate events as a response to user actions. A label is a widget, too, but, usually does not generate events. Shapes – lines, arcs, circles, polygons and other that belong on a canvas. Timers – threads that perform an action the number of times specified and sleep for the specified duration. From the definition “thread” you can understand that they run in parallel. This is the default window. It is displayed on the screen when the line ‘Tk.mainloop’ is performed. Until this window is closed, no commands that are not responses to events will be executed. “Programing Ruby – The Pragmatic Programmers Guide” suggests that you look at Perl/Tk guides to learn how to use Tk. A good place to look for Perl’s objects and their methods is Active Perl. I’m not going to write here the complete guide to Ruby Tk, but I hope the following chapters will help you understand how it works. When you write for the web, you may want to send data to another server or to a client. A common way to transfer that data is in XML format. The data will then be processed using SAX, DOM or XPath. Every language support it. Here no parsers are required.